Finding your other half was the hard part but finding which wedding band for your Big Day can bring with it its own set of challenges. Not all wedding bands will feel the same on your finger and this has more to do with the shape of the ring, rather than the type of metal. 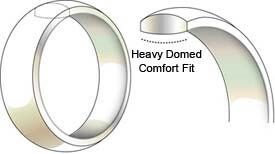 The two main interior shapes of rings are the comfort fit and the standard fit bands. Comfort fit bands are a more recent innovation. It is a style defined by a more domed centre with extra metal than that of the ‘traditional’, standard fit. The comfort fit tends to put less pressure on the finger and can be sometimes more comfortable for those clients unaccustomed to wearing rings. Wider bands (5mm and 6mm for example) suit the comfort fit shape as they are easier to squeeze over large knuckles. The ring will also create less friction while being worn as is covers less surface area on the skin. The traditional, or standard fit is an interior design that has been used by goldsmiths and artisans for centuries. It is a flat design along the interior of the ring, resulting in the same diameter from one edge to the other. 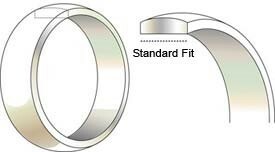 Standard fit wedding bands are usually cheaper to buy as they require less metal to be made than the comfort fit, which uses more precious metal to create the dome. Traditional fit wedding bands are not uncomfortable by any means; however, the comfort fit could be better suited to those men involved in physical labour, who might need to slip their ring on and off throughout the day. This entry was posted in Featured, Male Wedding Rings and tagged comfort fit, traditinal fit, wedding band shapes.